Pawan Gupta's findings on trans-boundary movement of pollution (Punjab to Delhi) from biomass burning in 2015 spurred debates. He participated in discussions with Indian regulators early September at the Better Air Quality Conference in Busan on the advantages of using satellite data for air quality monitoring. He explains to Down to Earth how air quality monitoring is done using satellite data. How is satellite data used to measure air pollution? Satellites that provide information on atmospheric pollutants are normally (not always) in the low earth orbits (400-1000 km above the Earth’s surface). A single satellite can carry one or more remote sensing instruments onboard that look down to earth and obtain information about the object in the field of view of satellite sensor. The Earth receives electromagnetic radiation from the sun, which travels through space and reaches the earth-atmosphere system. The radiation then interacts with the Earth’s atmosphere and the surface. That radiation is either reflected or absorbed by the surface or the atmosphere. Satellites measure both reflected and emitted energy. Depending on the purpose, different satellites measure this energy in a specific portion of the entire electromagnetic spectrum. Different constituents of the atmosphere (such as clouds, gasses, aerosols) or the surface (land, ocean, vegetation) interact with the incoming solar radiation depending on their properties and the wavelength of incoming solar radiation. The intensity of reflected and emitted radiation into space is influenced by surface and atmospheric conditions, and because of this, satellite measurements contain information about the surface and atmosphere. These spectral measurements of atmosphere are then combined with theoretical radiative transfer calculations to retrieve information about atmospheric pollutants. Retrieval algorithms are designed to extract specific properties of atmospheric pollutants. For example, aerosol optical depth is one such quantity, which is an optical property of aerosols (or particulate matter) and represents the loading of aerosols in the column (surface to satellite height) of the atmosphere. Therefore, satellites do not make direct measurements of the properties of atmospheric pollutants. Geophysical properties of atmospheric pollutants are retrieved from spectral measurements of radiation. What is the unit in which the measurements are made and how they can be made comparable to the existing lab measurements? Unit of measurements varies with parameter and pollutants. For example, Aerosol Optical Depth does not have a unit of measurement and depends on the amount, type (shape, size, chemical composition) and location of aerosols in the atmosphere. It also depends on the wavelength at which measurements are performed. This quantity, later on, can be correlated with surface measured PM2.5 mass concentration (μgm-3) and converted into air quality index. There are similarities and differences in satellite-retrieved aerosol optical depth and surface-measured PM2.5 mass concentrations. PM2.5 is the dry mass concentration of particles smaller than 2.5 μm in aerodynamic diameter at the measurement location and height whereas aerosol optical depth is an optical property, representing aerosol loading in the column of atmosphere over an area (defined by satellite resolution) and represent all types and sizes of particles under ambient conditions. But, both of these quantities are a measure of an amount of particles in the atmosphere and are often correlated with each other. Therefore, researchers over the years have developed methods to convert aerosol optical depth into PM2.5 for various regions of the globe. The inconsistencies in satellite-derived PM2.5 data vary a lot depending on season and region. 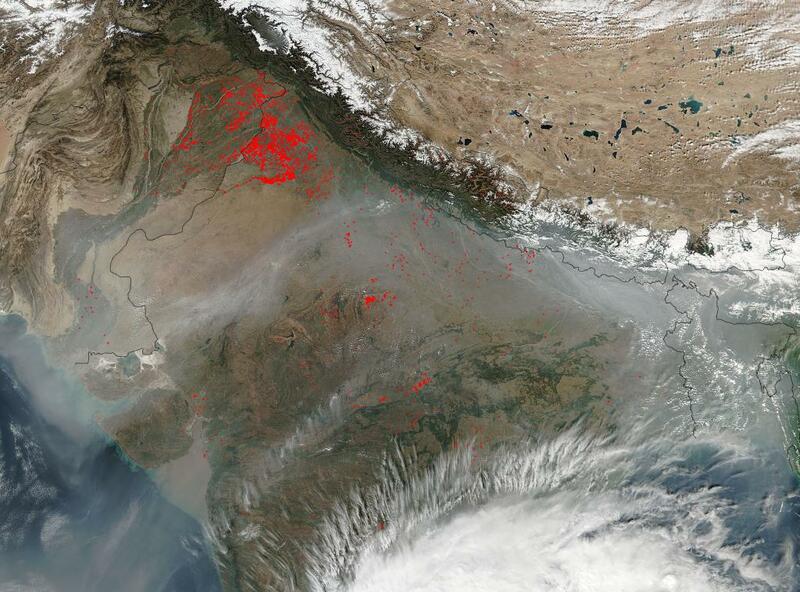 How frequently is air pollution data generated for India by the existing satellites? Usually, one polar-orbiting satellite provides one observation during day time over India (or any place on the globe). We can combine measurements from multiple satellites to get more than one measurements. The frequency also depends on the atmospheric pollutant. For example, aerosols (or particulate matter) measurements are only available during daytime under cloud-free conditions. Very limited night-time observations of air pollution are available from the satellite. Are these satellite images available for free and accessible for interpretation? Almost all of the air pollution-related data and images from NASA satellites are available on open public domains, free of cost. Data and analysing tools to address various applications are available for everyone to use. NASA’s Applied Remote Sensing Training (ARSET) program also provides professional training on satellite data and tools to people from around the world. What are the efforts happening to increase satellite data availability? There are several satellites which provide important information on various atmospheric pollutants across the world on a daily basis. Most of the information comes from low orbiting satellites, which can only provide 1-2 observation per day for a given place. These satellite observations are often limited to cloud-free regions. Therefore, several countries in the world are planning to launch geostationary satellites for continuous (every five minutes to one hour) measurements of atmospheric pollutants over a given region. Multiple satellites will be required to provide global coverage with high temporal resolution. The United States, South Korea and Europe already have plans to launch geostationary satellites for air quality in next 3-4 years. The Korean geostationary satellite will have partial coverage over India. The Indian Space Research Organization has capabilities to build and launch geostationary satellites for air quality monitoring and India should think in this direction. Other than new generations of satellites, space agencies like NASA are working very hard to make available satellite data sets more accurate and easily available through online platforms to support various applications. How satellite observations are being used to address various air quality issues? Satellite-derived pollution measurements provide a unique view of global air mass, which is not possible from surface measurements. Due to various technical restrictions, pollution measurements from a satellite can have larger irregularities and may not replace high-quality surface measurements. But satellite data sets are currently being utilised for smoke emissions estimations, smoke transport monitoring from forest fires, long-range dust transport, estimating annual mean PM2.5 mass concentration over global regions, evaluating air quality and climate models and long-term trend analysis over cities and larger regions.